Truxtun Historic District is a national historic district located at Portsmouth, Virginia. It encompasses 241 contributing buildings in a primarily residential section of Portsmouth. It was developed between 1918 and 1920 as a planned community of Colonial Revival style single family residences. It was developed by the United States Housing Corporation as a result of the rapid influx of workers at the Norfolk Naval Shipyard during World War I. It was the first wartime government housing project constructed exclusively for African-American residents. 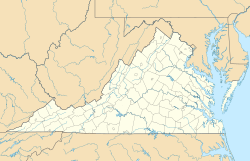 ^ "Virginia Landmarks Register". Virginia Department of Historic Resources. Archived from the original on 21 September 2013. Retrieved 19 March 2013. This article about a property in Portsmouth, Virginia on the National Register of Historic Places is a stub. You can help Wikipedia by expanding it. This page was last edited on 10 July 2018, at 15:48 (UTC).